You will earn 3,477 Reward Points. Earn 1 reward point for every 1 dollar spent. • 22 gauge stainless steel construction complete with recessed stain less steel handle. • Doors sit within an ex clu sive rollerless track assembly, provid ing easier clean ing and lower maintenance. • Each compartment is fitted with a 750-watt tubular element above the insulated bottom. • 6´cord with plug extends from the righthand control side as standard equipment. • Complete unit is wired to a master toggle switch with indicator light. • 120-volt units are single phase. 240-volt units available in single- and three-phase. • Table body and top constructed of highly polished heavy gauge 430 series stainless steel. • Top has die-stamped beaded openings measuring 123 ⁄32˝ x 203 ⁄32˝ (307 x 510mm). • A poly cutting board 8˝ wide x 1 ⁄2˝ (203 x 13mm) thick is mounted on drop brackets located on control side of unit. • 5˝ (127mm) diameter NSF-approved ball bearing swivel casters (two with brake). • Push bar attached to end panel at operator’s right. • Full perimeter bumper guards. 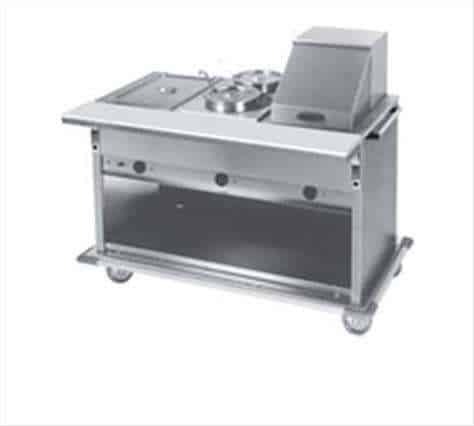 Eagle Hot Food Tables, Spec-Master® series, model PHT3CB-120 enclosed base design. Top and body to be heavy gauge type 430 stainless steel (Open Front or Sliding Doors). Beaded top openings to be 123 ⁄32˝ x 203 ⁄32˝. Heating compartments to be 8˝ deep, galvanized, and insulated on all four sides and bottom with 1˝ fiberglass or equal. Recessed control panel with individual thermostatic controls. Each compartment fitted with 750-watt tubular heating element above the insulated bottom. 6´cord and plug. Complete unit wired to master toggle switch with indicator light. Furnished with polycarbonate cutting board. Includes 5˝-diameter swivel plate casters (two with brake). • Individual thermostatic controls offer a wide range of temperature settings. • Indicator light remain on continuously while control is on.